The properties of a table could already been changed by the user itself in Personalization Mode. 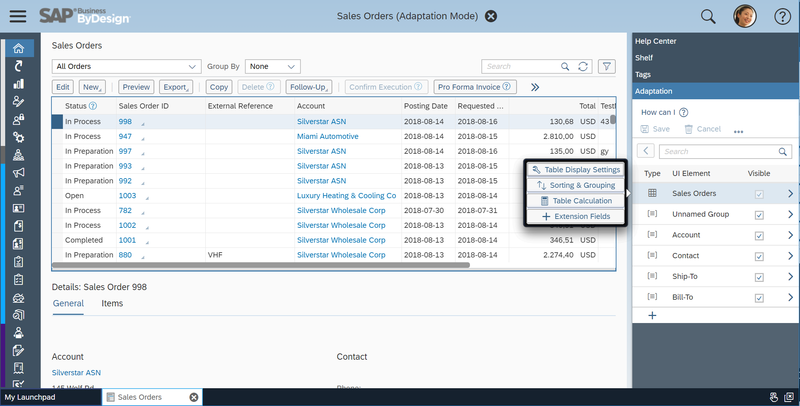 However this is also possible that a key user does these changes for the whole company, in the Adaptation Mode by opening the context menu (right mouse click) on the table itself or the table entry in the sidecar. And then pressing the entry “Table Display Settings” which opens up a popup to change the properties of the selected table. 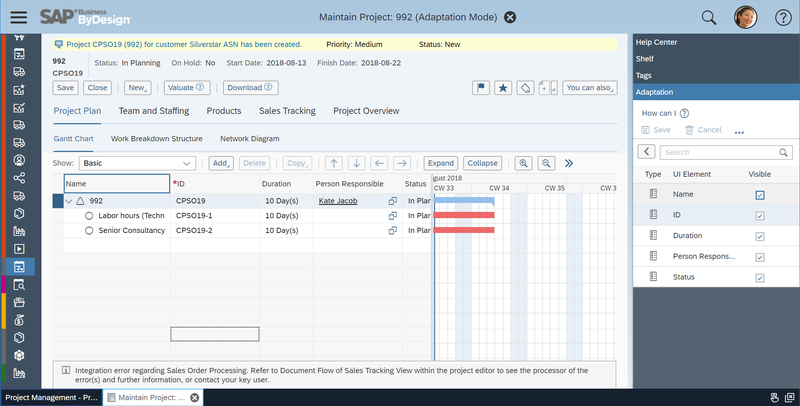 The columns of a Gantt Chart can now be changed (order, label, visibility), per selection in Personalization as well as Adaptation Mode. The change the order of fields inside a field group drag & drop is supported once the Personalization or Adaptation Mode is open. However there are some situations where this might not work for accessibility reasons or in some advanced search forms. So, in any case a field should be reordered inside its group the new move action could be used by selecting the entry in the context menu (Personalization or Adaptation Mode has to be switched on). After selecting the move button, arrow buttons will be displayed and indicate in which direction the field can be moved to. The selection is either done via the left mouse button (tap) or via the space key. Switching between the arrow buttons can be done via the tab and shift & tab key(s). The arrows will disappear once you click/tab on something else then the arrow buttons. 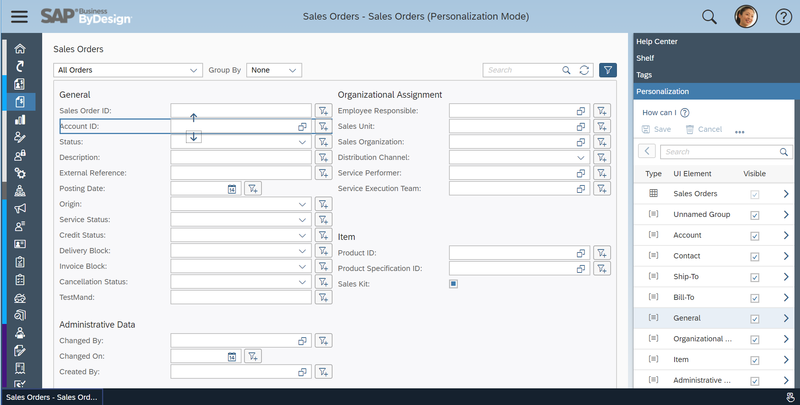 The mobile client of SAP ByDesign has now also enabled the personalization capabilities for the end user itself. You enter the Peronalization Mode by tapping on the users picture in the left upper corner. That will open up the so called “Me Area” in which the Personalization Mode can be switched on by tapping the button Personalize. Once the Personalization Mode is switched on the launchpad will look similar like in Personalization mode on the desktop. 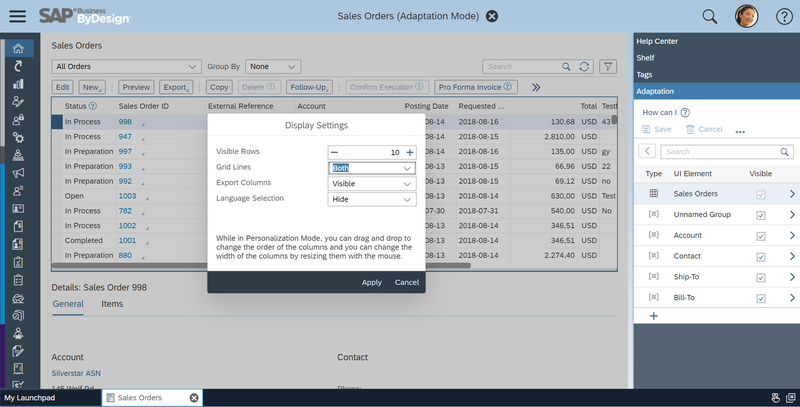 Please note, key user adaptation, like the desktop version of SAP ByDesign supports via the Adaptation Mode, is not supported by the mobile client. If a key user wants to adapt a mobile screen for all users of its company he/she has to start the desktop client with the mobile url parameter sapbyd-agent=MBLHTML and use the Adaptation Mode there. The personalization of the mobile launchpad is very similar to the desktop personalization of it. For example the gallery, to add new tiles to the launchpad, is also opened via the plus button. However there is no sidecar on the mobile client and also no right mouse click to open the context menu of an UI element. To open up the context menu the long press event is used on the mobile client. If you do so on a tile on the launchpad the context menu will pop up. On this the regular operations like change a label, etc can be performed. Drag & drop functionality, which is used on the desktop version is not supported on the mobile client, but if you press the “Change Position of Tiles” button a tree will be displayed in which you see the current UI element selected. Here you see that the tile “Leads” was selected and that this looks for a new position. If you taps now on another position the tile will directly be moved to this one. In our case the user taps on “Contacts” which will move the “Leads” tile from the group “Marketing” to the group “Account Management” at position 3. Once you tap the “Ok” button the change will be performed but there as usual there are not yet saved. To save you have to tap on the upper right personalize button, which opens a popover in which you can trigger the save operation. 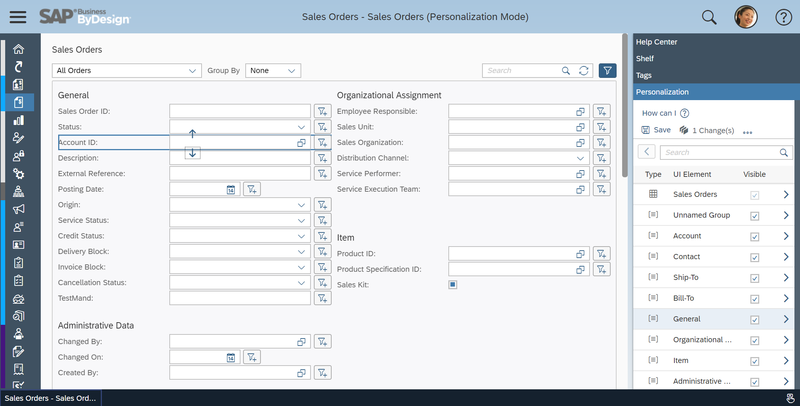 In the popover you can also perform the other function which are part of the sidecar in Personalization Mode of the desktop SAP ByDesign client like undo, redo, cancel, discard plus the ability to leave the Personalization Mode of the mobile client. Is explained in another post. See here.